Sure, there are lots of ways to travel the world. Train, plane … automobile. But hows about 113 days on a luxury cruise ship? 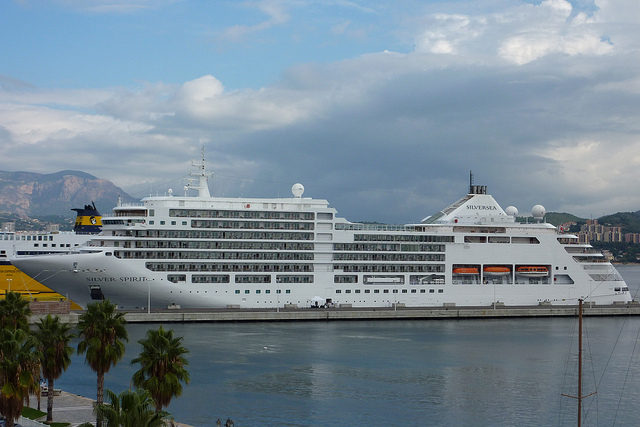 Starting next year in 2014, a ship called the Silver Whisper can take you literally around the world. You’ll start your epic journey in Los Angeles and end in Barcelona about 4 months later. You and the other 381 guests will visit 54 different ports of call, and get 29 stamps in your passport. Now, while we were almost convinced when we read that private car service transfers and laundry service were included, the price of the Grand Suite might be just out of reach for most at $140,050 USD. (Why the extra $50 bucks? Because they can.) Perhaps the Vista Suite, which still looks larger than this author’s first studio apartment, might be a more economical option at a paltry $54,550 (again with the extra $50 …). Really, the choice is yours. Read more about the shorter voyages offered in 2013 here, and visit the Silver Sea website here. Even if I could afford it (which I most certainly can not), Im not sure I could live on a ship for 4 months. We recently did a 14 day Caribbean cruise, and while it was absolutely wonderful, I was happy to get back on land at the end of it. @Nicole: Agree completely! After 10 days on a ship, I was ready to be back on solid ground. Even with numerous ports of call, it just grows tiresome!